Jaden Hair, professional recipe developer, television chef and author of the blog Steamy Kitchen recently decided it was time for a kitchen makeover for her Florida home. 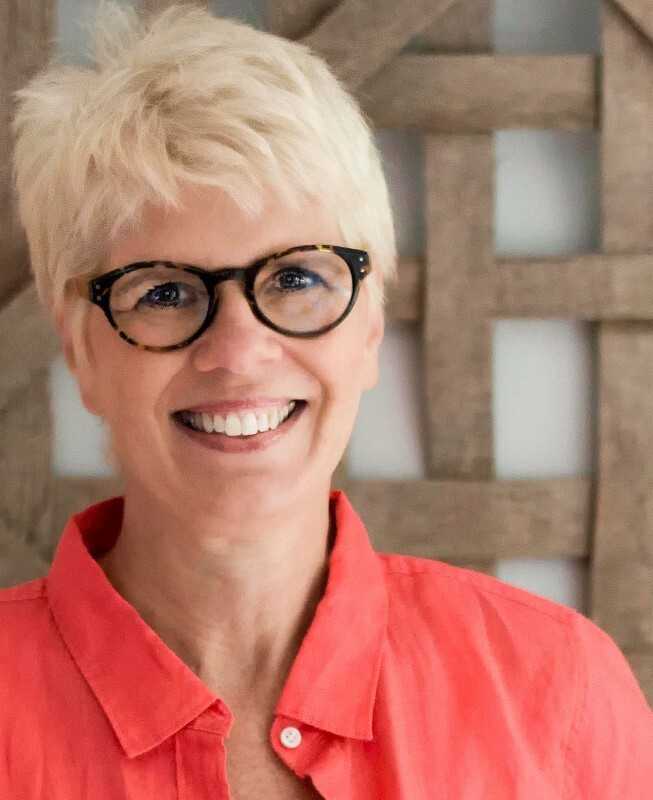 She enlisted the help of designer Susan Serra to help her create the perfect kitchen that’s fit for a hard working chef, as well as a busy family of four. Jaden only had two requests, a wide open space that would accommodate both family activities and still maintain a large enough area for prepping and cooking, her second request- no laminate! We interviewed Jaden to hear her thoughts on her beautiful new kitchen and see how Top Knobs was able to assist in bringing the design to life. 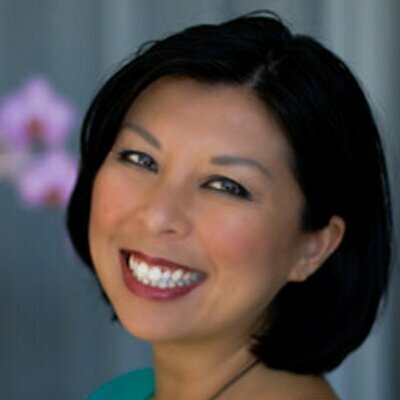 Q: What’s the recipe to working with a designer to bring your vision to life? I’m such a DIY gal, ​that I briefly considered designing this kitchen on my own. But within an hour of doing research and sketching out a design on paper, I realized that we’d be putting ourselves at risk if we didn’t hire a professional designer. Susan flew to our home in Florida from NYC and flew home the same day. We spent about 3 hours measuring, re-measuring the kitchen​ and discussing ideas. For example, we talked about our love for gardening, where the kids do their homework (which led to the large center island) and the serene mood we wanted to evoke in the space (which led to the Top Knobs Chareau collection). Q: We saw your one requirement was “no laminate!” Did you face any other design challenges during the remodel? We wanted a kitchen design that was timeless: modern but not trendy. This kitchen should fit our tastes and lifestyle – but also future homeowners as well. My specialty is Asian cooking, but we didn’t want the kitchen design to be too Asian inspired. We ended up adding the Asian touches with a Happy Buddha statue carved from a piece of bamboo that my parents hand-carried from China (sits on top of the cabinet) and a Chinese hand-painted silk piece that we framed and hung on the wall. The rest of the kitchen is clean, simple, yet elegant and refined. “The classic, beautiful design of the Top Knobs handles finished the look of our kitchen,” exclaims Jaden Hair. 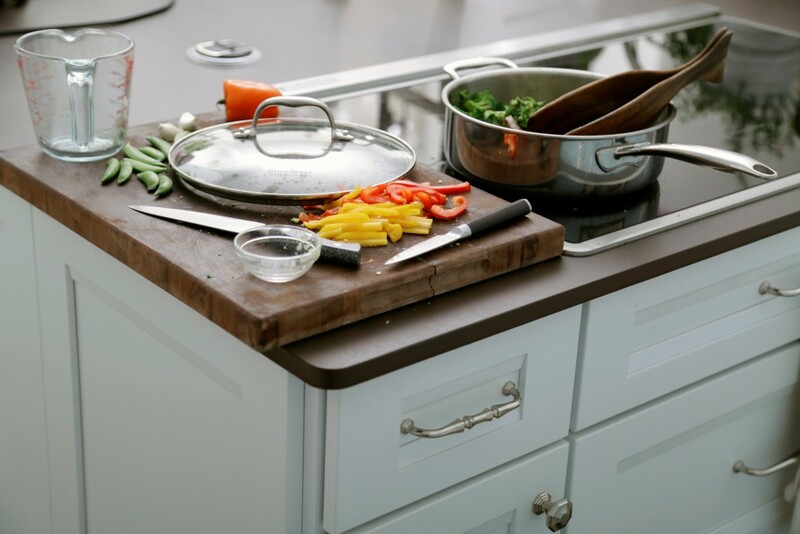 Q: As a chef, I’m sure you have specific needs to create the perfect kitchen environment. How did Top Knobs help create that? Each knob and handle is so sturdy and solid. 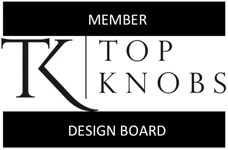 Top Knobs has taken such great care in craftsmanship and I expect their product to last a lifetime! Q: What is your favorite part of your new kitchen? Hear from the kitchen designer, Susan Serra’s perspective in part one of this blog post. 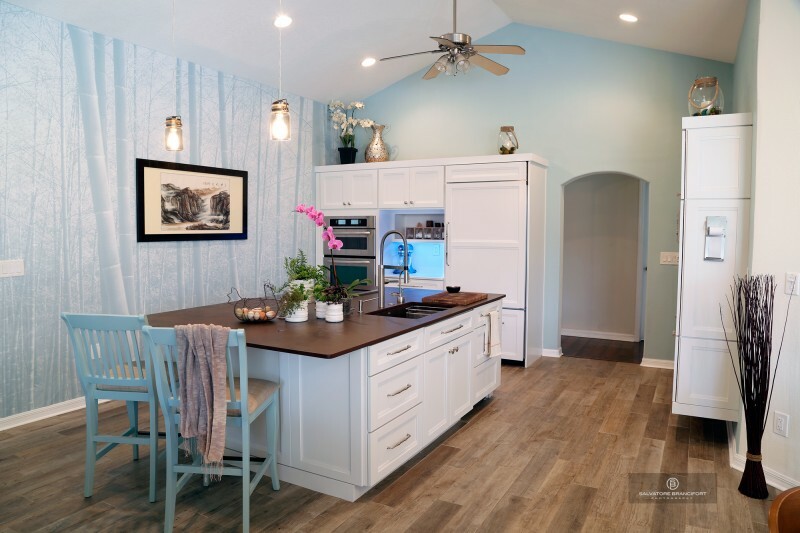 Designer Susan Serra recently teamed up with television chef, cookbook author, and author of the blog Steamy Kitchen, Jaden Hair to renovate and design Jaden’s new and improved kitchen space in her Florida home. The goal for this design was to provide Jaden and her family with a wide open area for family activities while still maintaining enough space for prepping and cooking. 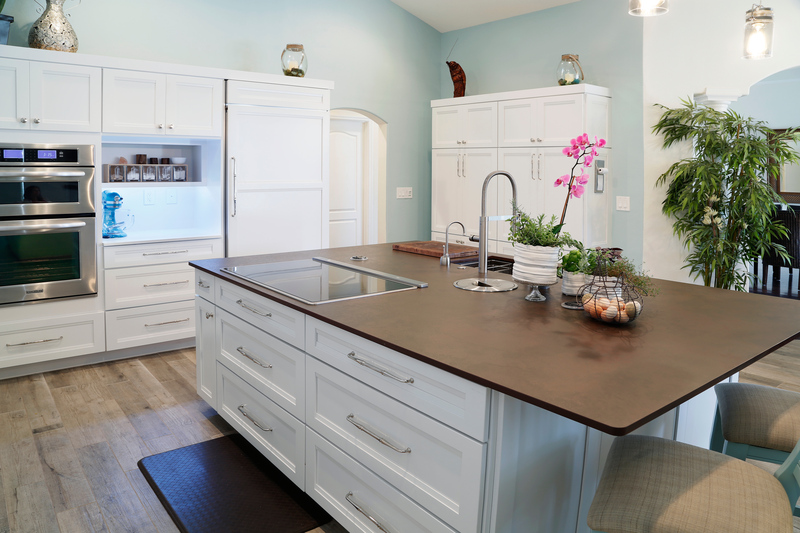 With the help of Top Knobs Chareau collection Chalet pulls and an eye-catching wall mural, Susan was able to design a kitchen suitable for both a hard-working chef and a busy family of four. Top Knobs interviewed Susan to learn exactly how she was able to create such a multifunctional design. Q: What was your biggest design challenge during this remodel? The challenge for every kitchen is to find the perfect balance between function and aesthetics. My philosophy is that aesthetics and function should be equal partners starting out in the design process. Sometimes one or the other will emerge as the leader, sometimes not. In this case, due to a large walk-in pantry outside of the kitchen, storage was not the critical functional element to lead the design as it often does in most American kitchens. We found the sweet spot! As a result, the hard surfaces (cabinetry) are not visually overwhelming in the space, especially as it is an open plan concept, open to a dining space and family room. Q: How did Top Knobs help you to create the perfect kitchen environment for someone who is a mom, wife, and chef? The first thing that comes to my mind as I answer this question is STYLE. After all, it’s usually the first thing one notices when experiencing a kitchen. The Top Knobs hardware was chosen for its visually soft properties. I love the selection of extra long pulls paired with knobs. Although good looking in their own right, the long pulls make access to cabinetry quick and easy. They also add a more horizontal perspective to the cabinetry, which I like. Q: What was your inspiration for the stunning wall mural? The mural was a joint effort. I suggested a mural to feature this single wall and Jaden chose a motif that she feels very connected to – the bamboo forest, a homage to her heritage. I do love the effect in the room! Q: What other materials and techniques were used to create this kitchen? It was important to me to unite each wall of cabinetry with the same size top doors so the eye experiences this symmetry. This took quite a bit of coordination with stock KraftMaid cabinetry, believe it or not, but you don’t need custom sizes to be creative. Had the wall cabinet to the right of the oven been taller as it would be designed typically, it would disrupt the top line of cabinetry on both walls. Stay tuned for chef Jaden Hair’s perspective on this stunning kitchen remodel in part two of this blog post.